Focus on our customers and Innovation have always been two of our core values at Orchard Scott’s Dental. This is why we specialise in non-invasive treatments like Invisalign; a cutting-edge, clear dental aligner system that has helped correct the dental issues of over 5 million people worldwide. As an innovation, Invisalign has replaced the need for traditional braces in many situations, depending on the severity of the dental correction needed. Also, with its transparent look, it is a virtually invisible system, allowing many of our adult patients to treat long-standing issues with confidence and without the aesthetic social challenges of braces or retainers. At OSD we use the system alone or as part of a multi-discipline approach, to support other treatments done by our internationally trained dentists. Invisalign is ideal as a support procedure for veneers or implants, to guide the dental movement that those treatments require or allow. While certain dental issues will need a more intensive treatment plan, our dentists can use Invisalign to provide treatment for many versions of malocclusion; the most common of which we list below. When upper and lower teeth do not align correctly with an anterior crossbite, where the upper back teeth bite down inside the lower back teeth, or posterior crossbite, where the upper front teeth bite down behind the lower front teeth, various physical and emotional challenges can arise. Tooth decay, gum disease and stress on the jaw and neck are all potential risks. If left untreated crossbite can result in neck and back pain and even asymmetrical facial development that can cause social insecurities. A mild underbite can be fairly easy to live with, however, if it becomes pronounced it can lead to discomfort in jaw muscles and chewing issues. 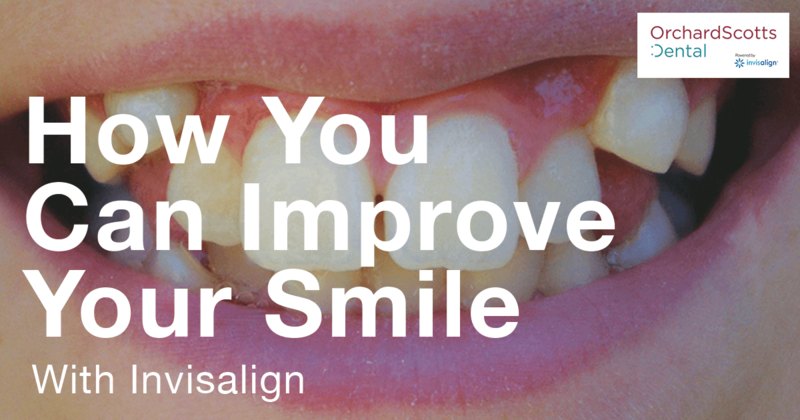 At that point, it is wise to treat the misalignment to ensure a comfortable, more natural jaw position. Also known as a diastema, gapped teeth can be caused by several issues. If the gap is due to a mismatch of jaw size to teeth, there is often no cause for concern and will not change with time. However, if the gap is the result of periodontal disease, it will probably worsen, leading to loose teeth or pain especially while chewing. With an open bite, the top and bottom front teeth are prevented from meeting when the mouth is closed. Though this may not cause discomfort, it can affect your physical appearance or cause a lisp or other speech impediment, which may cause social embarrassment or in severe cases, issues being understood. Overcrowding usually worsens with time and can cause poor oral hygiene. Overlapping teeth limit access when brushing and flossing, and can lead to a build-up of plaque or even tooth decay and gum disease. With a deep bite, the top front teeth excessively overlap the bottom front teeth which can lead to jaw and joint problems if severe. Alternatively, it can lead to gum pain, should the overlap be so severe that the lower teeth rise up and graze the top inner-palate, or to the teeth wearing unevenly due to the irregular bite pattern. While many of the above Malocclusions may appear in mild forms and cause no discomfort, it is wise to allow a dentist to establish whether treatment is necessary. It is possible symptoms may have manifested in other areas of the body, e.g. back pain, or tension headaches which could be cured through dental corrections. Once your dental issue has been identified, we begin the treatment process by recording your existing dental state with Photos and X-rays. Then, using ITero 3D scanning technology, we create a detailed map of your mouth, avoiding the need for any sticky impression trays and speeding up the aligner printing process. Once the scan has been completed, we will use the detailed map to decide how best to correct your malocclusion, establish the length of treatment and the number of aligners necessary to complete your smile makeover. Once a treatment plan has been decided, we send the 3D scan to Invisalign to print your unique set of aligners, for your full treatment, in BPA-free thermoplastic. The aligners are 3D printed to exactly fit your teeth to ensure efficient and accurate treatment, with less pain. The success of the treatment is largely in your hands, as you will be given your set of aligners to take home following every consultation and it will be your responsibility to wear them for a minimum of 22 hours a day and change your set every 2 or so weeks for the duration of the treatment. By doing this, dental visits can be less frequent, saving you time and money. You can also track your progress using the My Invisalign Smile app, just another way we make the treatment easier and more holistic; keeping you informed. Using the cutting edge technology of Invisalign, OSD has provided smile makeovers for over 1800 people in Singapore. A personal consultation with one of our Internationally trained dentists will be the best way to establish how Invisalign can help perfect your smile, and give you all of the information needed before you start.